Japan, which has long been under scrutiny for killing and taking minke, humpback, and fin whales around Antarctica, has now been ordered by the UN’s International Court of Justice to cease and desist. Although commercial whaling has been outlawed ever since a ban by the International Whaling Commission (IWC) going back to 1986, Japan’s practices exploit a provision in the whaling ban that states whales may still be killed for scientific purposes. 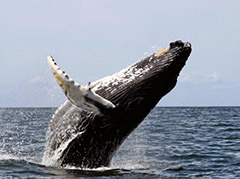 Groups like the World Wildlife Fund have long criticized Japan’s actions as the exploitation of a loophole, especially since Japan has always agreed to take part in the ban. The new order against Japan results from a suit brought against the country by Australia, who asserted that Japan repeatedly failed to provide convincing evidence as to why their scientific study of the whales required killing. Leah Gerber, a marine mammal biologist at Arizona State, argues that the type of research Japan claimed to be performing on the whales  the study of information such as reproduction rates and diet  could easily be done with simple biopsies on the blubber of the animals. The large number of whales taken by the country was also never justified. Gerber also pointed out that while the Japanese whalers did collect the animals organs to conduct research, the majority of the whale would go to market and be sold for consumption. Unfortunately, the new ban only applies to medium and large sized whales, and smaller sea creatures like dolphins, may still be hunted. Japan’s controversial killing of dolphins was well documented in the film Dolphin Cove, and there appears to be no end in sight for these practices. Some countries, like Iceland and Norway, refuse to take part in the 1986 IWC ban and continue to hunt whales. Norway, however, limits their activities and abides by sustainability guidelines put in place by the IWC, while Iceland does not.